Let's be real. How many of you have judged a book by its cover? Today I am linking up with The Broke and the Bookish for their weekly Top Ten Tuesday and today's prompt is ten books with fall themes and covers. This cover features a cat and for some reason I associate cats with fall. DO YOUR BRAINS EVERY MAKE .. strange.. CONNECTIONS. like cats with fall??? or am i crazy. Probably the latter. This is one of the only books on the list that actually relates to fall. Because back to Hogwarts? And the halloween chapter? IT MAKES SENSE OK.
LIKE I SAID. LOTS OF RED. basically the red just sold it for me. But for real, I literally grew up on mysteries. My mom owns every single Agatha Christie, Anne Perry, Georgette Heyer novel EVER. crazy. OK I ACTUALLY HAVEN'T READ THIS BOOK YET.. but this book cover screams fall. the colors. drool. Because it's kind of set in fall?? Right?? Yes? Also peep my obsession with Bath and Body Works lingering (AHAH THE PUNS) in the background. RED AND ORANGE COVERS. and ps i will never stop using the fuzzy blanket and orange fairy lights in my pictures. NEVER. While this isn't exactly a ... cozy book.... the cover does give me a warmish feel and there's some parts that are set in the cold? I'm reaching here. RED. ALL THE RED. i own way too many red books. I don't think I buy them for their colors, but who knows maybe it's another weird brain connection. 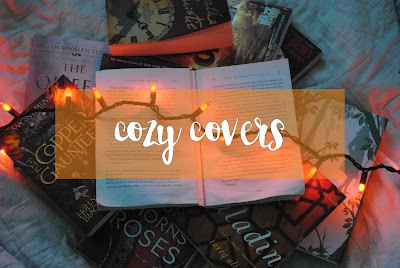 Do you buy/read books by their covers? YES I KNOW YOU DO. What are some weird connections your brain makes? WHAT ARE YOUR FAVORITE “fall” BOOKS? Let’s talk! Yes, fall books! Love this.